When you decide to go to a foreign country one of the essential things is money management. An NRI has to put in efforts and do lots of planning in order to ensure that money does not become a thing to worry. Here are some simple tips which can help NRIs in a big way. In India an NRI cannot continue with a normal savings account. He must convert his bank savings account to an NRO account. It becomes much easier to carry out transactions and deposit money from investments in this account. The NRI must give a power of attorney to a trustworthy person. This person can take care of the property when you are abroad. This person can also carry out all financial transactions in the absence of the person. As an NRI you may be concerned about where to make investments. This is relatively simple. You can invest in bank FDs or you can even invest in property or mutual funds etc. There are plenty of options and you must opt for one which is safe and which will give you good returns. You must conform to the FEMA rules and regulations. You can buy residential (not more than two) and commercial property but you cannot buy agricultural property or a farmhouse. But an NRI can inherit an agricultural property or farmhouse. All the transactions have to be in Indian currency. NRIs can invest in life insurance policy. But whether to invest or not will depend on many things. Do you wish to come back to India? Will there be any tax implications in the country where you are currently staying? Etc. It is also important to check all the terms and conditions and requirements of the policy before investing. If you have loans to clear in India then you must check how fast and easily you can do the same. If the country where you are staying has less rate on interest then take loan from there and repay your loan here. While buying the health policy it is important to check if you can get treatment with the policy in another country with this policy. You must also keep a tab on the currency fluctuations as this will have an impact not just on your loans but on many other financial matters. A lot about financial management / money management will depend on your future plans. Whether you plan to come back to India or will stay in a different country all your life etc. If you want guidance on matters regarding the management of finances while you settle down in a foreign land then you can consult us. We at Kansas Overseas Careers have experienced professionals who can give you valuable advice on a number of things. This includes advice on finance management, career management and visa management. 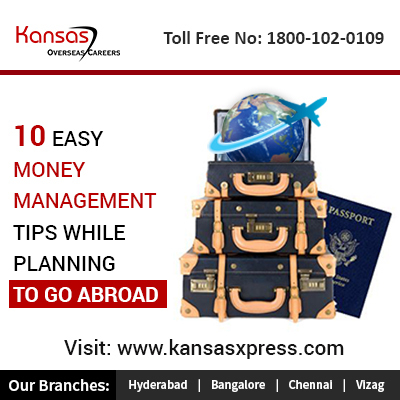 To know more information call @ 1800-102-0109 or Register @ http://www.kansasxpress.com/ask-an-expert .